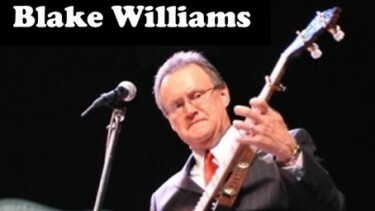 An accomplished musician, master of ceremonies and entertainer, BLAKE WILLIAMS has been in professional entertainment for over 40 years. After nine years as a disc jockey for WSMT, he toured with Bobby Smith & The Boys From Shiloh and soon moved into the role of banjo player for Lester Flatt and the Nashville Grass until Lester’s death in 1979. Blake went on to work with the Father of Bluegrass, Bill Monroe, for ten years, making him Monroe’s longest tenured banjo player. In 1991, Blake was invited to play bass with comedian, Hee Haw star and Grand Ole Opry member, Mike Snider where he stayed until 2001. In early 2002, Blake founded the group The Expedition Show (formerly Williams & Clark Expedition) and continues to perform professionally. During his career, Blake has toured 48 states and seven countries, played Carnegie Hall, the Kennedy Center, and the Lincoln Center. He recorded two albums with Lester Flatt and six albums with Bill Monroe for which one of them, Southern Flavor, won the first Grammy for Bluegrass Album of The Year. You can hear Blake’s bass work on five albums with Mike Snider and two live videos, as well. He has also performed on projects by Patty Loveless and Vince Gill. Blake has recorded three solo projects and performed regularly on the Grand Ole Opry for over 23 years. In addition to his musicianship, Blake is an excellent master of ceremonies and one of the best country comedians in the business. He has also enjoyed songwriting success having his songs covered by Lester Flatt & The Nashville Grass, Rhonda Vincent & the Rage and The Expedition Show. Blake is a three-time SPBGMA (Society for the Preservation of Bluegrass Music in America) Entertainer Of The Year nominee (2007-2009) and he graced the cover of Banjo Newsletter in May, 2008. In 2009, the City of Sparta, Tennessee erected new city limits signs declaring Sparta as the Home of Lester Flatt, Benny Martin, and Blake Williams. In 2015, Blake won the International Bluegrass Music Association’s Recorded Event of the Year for his work on “Southern Flavor” with Becky Buller.